The cover of the fall 1991-1992 Consumers catalog. The company stayed in business until the mid-1990s, although my local store was gone by then. 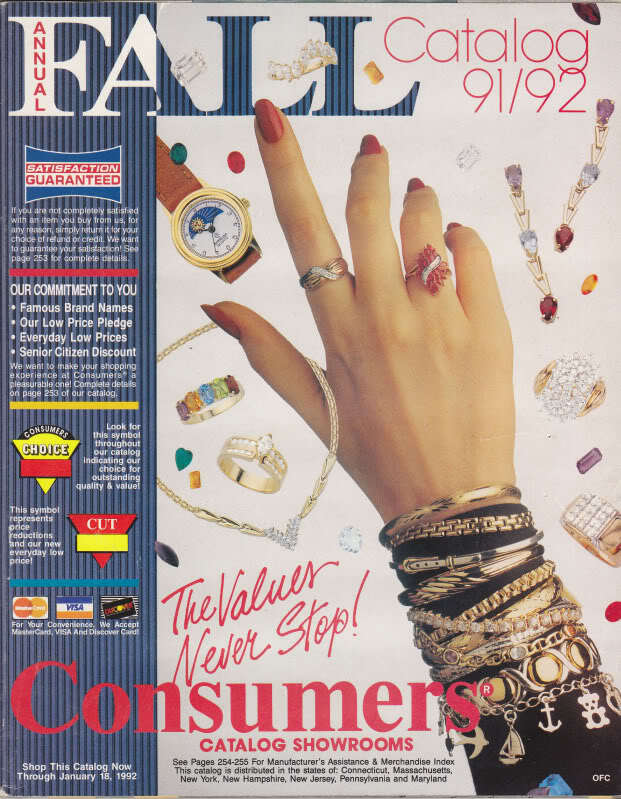 Consumers was a catalog-based store that was founded in Canada as Consumers Distributing in 1957 and expanded over the course of a couple of decades, adding stores and then buying out other, similar retail outlets, something that helped them to pop up with more frequency during the 1980s. The idea behind the store was similar to its main competitor, Service Merchandise: the company published a catalog and then anyone who wanted to buy something from the catalog would head to the local retail outlet–usually at a mall–and pick it up. That is, if they actually had anything. The arrival of the Consumers catalog twice a year was an event. My friends and I would grab it out of the mail and skip right to the toys and games section. Open before us was a display of everything we ever wanted, from G.I. Joe figures and vehicles to every Nintendo game that we’d ever seen advertised anywhere. 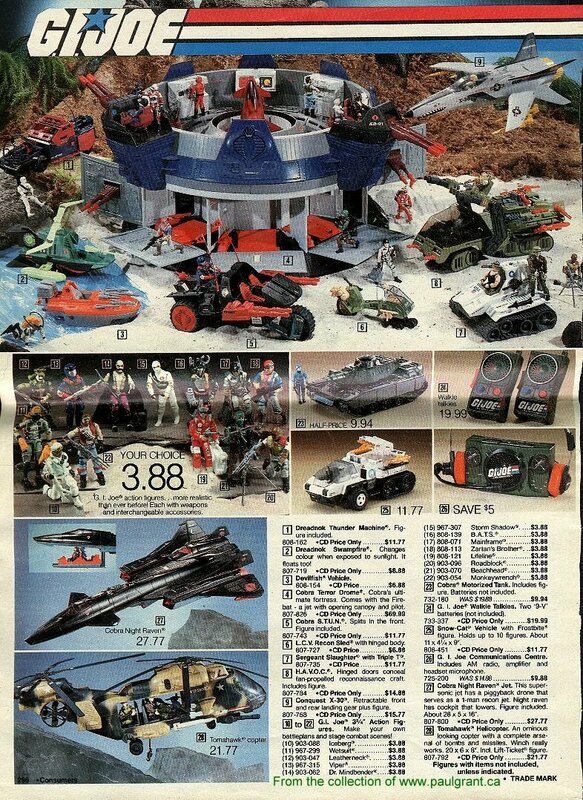 Plus, the prices were much better than what you would get at Toys R Us–not that Toys R Us was overpriced or anything, but any time you can say, “Hey Mom! The Legend of Zelda is only $45 and not $60! Can we get it?” you have a better shot at getting what you wanted. That is, if your parents were completely gullible, which mine were not, but that didn’t stop me from trying. Unfortunately for those who actually got this ploy to work, going to Consumers was usually a bust because they would head to the store, find the item on display, give the cashier a ticket and most of the time discover that said item was currently out of stock. According to the Wikipedia page on the store, this led to the company creating what was then an innovative inventory checking system, where they were able to look up the item you wanted on the inventory of every store in the area, which is something that we take for granted in today’s retail world. But the prevailing perception was that most of the merchandise at Consumers was non-existent and as much as the company tried to change that, I don’t think it really helped. It also didn’t help that the Consumers store in the Sayville area was in the Sun Vet Mall, a mall that was closer than any of the malls in the area but was clearly third-tier, especially when compared to the South Shore Mall and Smith Haven Mall, which had big-name department stores. Sure, Sun Vet had The Gap, which was convenient when I was in junior high and high school, but its anchors were a Rickel Home Center and a PathMark, so it didn’t exactly scream “Galleria” if you know what I mean. The Consumers store was located in the corner of the mall near the Gap and McCrory, both of which have since left, and whereas the other malls always were bustling, Sun Vet always seemed half dead and while the mall’s pizzeria was excellent and Sun Vet Coin and Stamp always was good for a few back issues, you only went there if you absolutely had to or if you were like me and my friend Jeremy, who would ride there on our bikes when we were teenagers simply because we had very little else to do. Whereas Service Merchandise would be a huge store that was part of a brand new shopping center down the road, Consumers was shoved into that corner and while the first few catalogs would get people there, the store was pretty dead within a year or two, especially as we’d taken to dragging our parents back to Toys R Us or anywhere else where we knew that would have what we wanted in stock. So in a way, it was a learning experience about being more strategic in begging for toys and other stuff as well as being more patient, and perhaps that is why so many of us are more intelligent these days about where we shop.